When it comes to remodeling your bathroom, size does matter. And if you're working with a small space, it's all about utilizing and optimizing square footage in a smart way. That means functional and properly-scaled furniture that provides ample storage, wall-mounted units to get around a lack of floor space, and accessories that do double duty, like decorative woven baskets to stash extra towels. Ready to revamp your restroom? 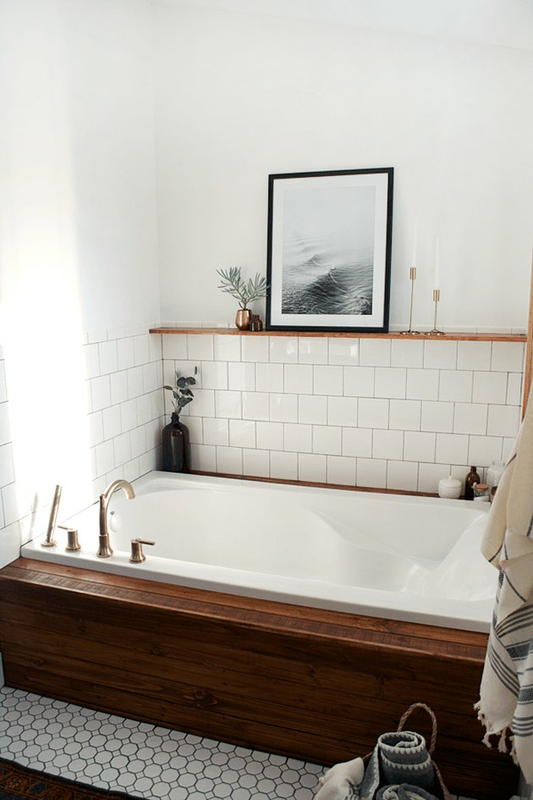 Whether your design sensibility skews rustic, contemporary, or midcentury modern, let these 11 ideas inspire you to create the bathroom of your dreams. 1. Flaunt your feminine side. 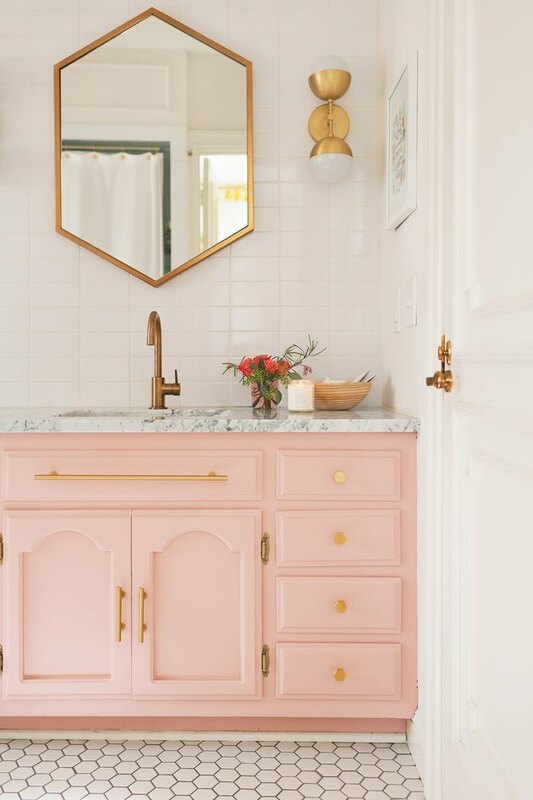 We are loving this pretty in pink bathroom redux by A Beautiful Mess. Sometimes all it takes is a can of paint and some pro-level styling to give a bathroom a much-needed facelift. Natural brass knobs, patterned hand towels, and fresh blooms complement the ladylike blush hue of the existing vanity cabinet. 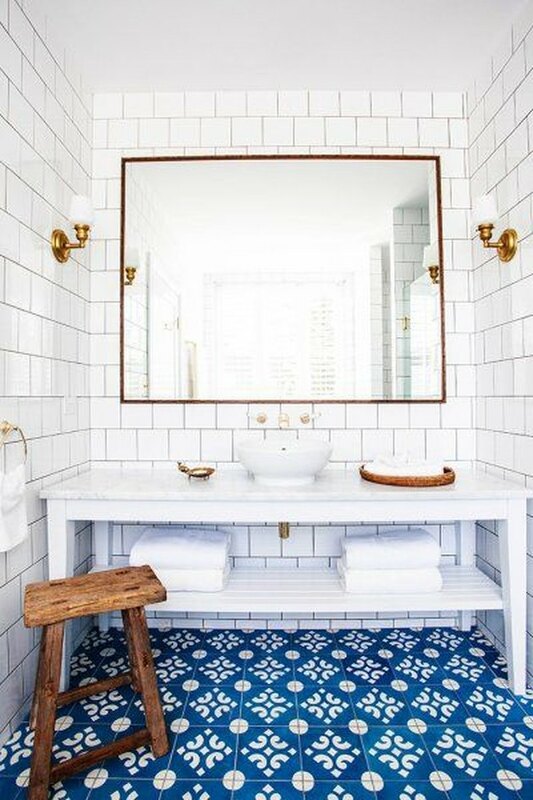 A monochromatic palette, like this one designed by Sarah Sherman Samuel, can make a bathroom feel airy and bright. 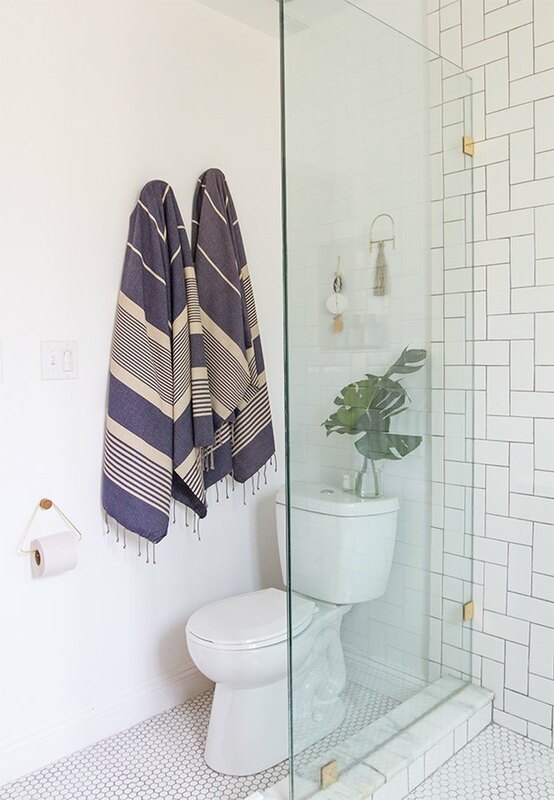 A contemporary bathroom with bohemian accents, subway tile, a glass-walled shower, and a few choice accessories — Turkish towels, a copper toilet paper holder, lush leaves, and retro string art — pull it all together quite nicely. Prints and patterns are a great way to introduce some larger-than-life personality into a small space. Don't be afraid to mix and match to transform your bathroom into a delightful visual treat. 4. Journey to the coast. 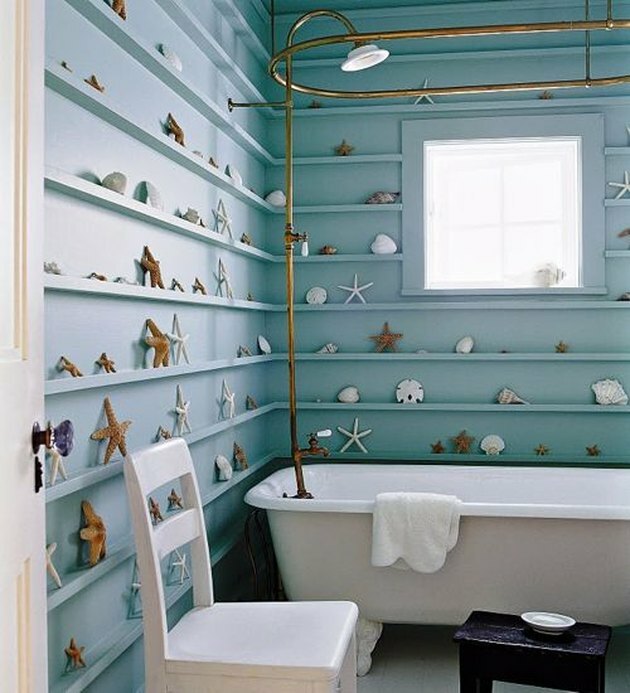 Regardless of whether or not you live near the water, you can still convert your bathroom into a seaside oasis. Take a page out of Kerry Joyce's design notebook, and create a coastal vibe with cool blue and white hues, along with ocean-inspired decor, like seashells and star fish. "Out with the old, in with the new" isn't always the right motto. Take it from designer Kali Cavanagh who carefully restored this Australian miners cottage. Any space with this much character, ripping out all of the original architecture and detailing would be a mistake. Simply swapping out the dated sink, toilet, and fixtures instantly updates the bathroom. While the addition of vintage and industrial accents and decor amplify the its rustic charm. 6. Have fun with flooring. Love the look of old beach hotels? We second that emotion! 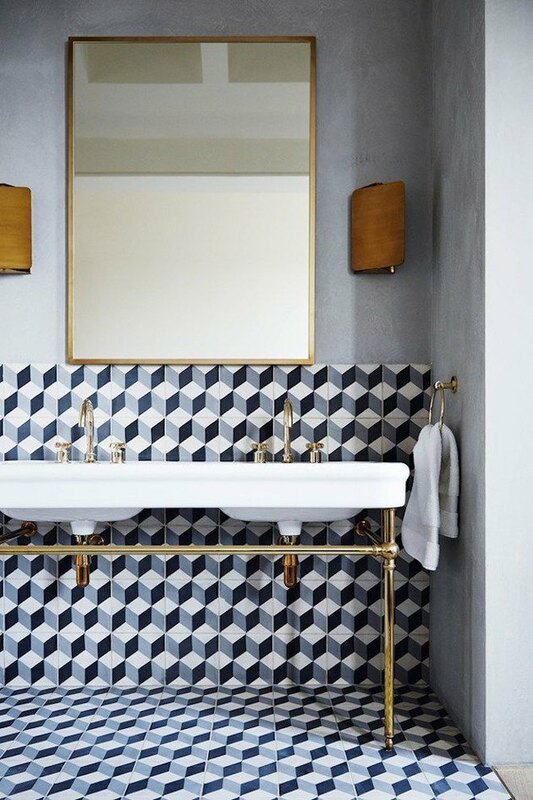 Inspired by that design aesthetic, Black & Spiro decked out this bathroom with hand-made blue and white tiles on the floor complemented by chic brass fixtures and hardware. 7. Surround yourself with wood. Warm up your bathtub by adding a lovely wood surround and accent wall shelf. 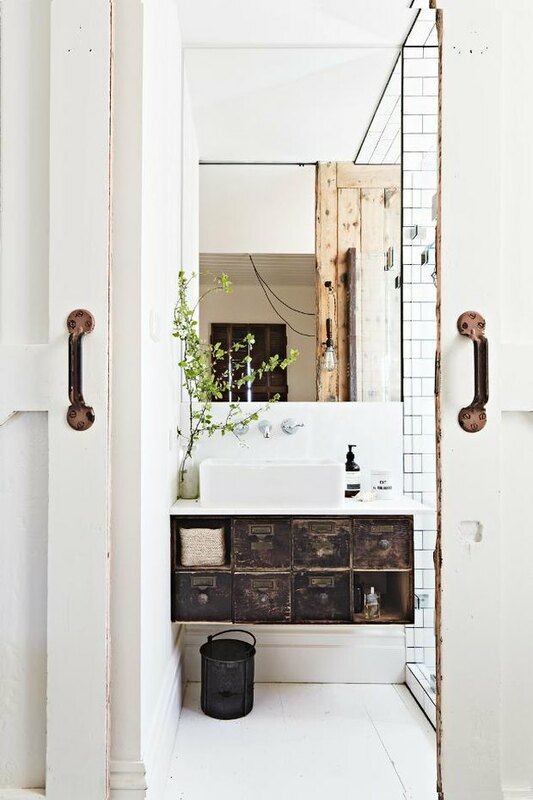 Not only does it look stunning and add rustic charm to your bathroom, but it also gives you a little extra space for scented candles and bath salts. 8. Invite whimsy with accessories. Rely on accessories to enhance your desired aesthetic. 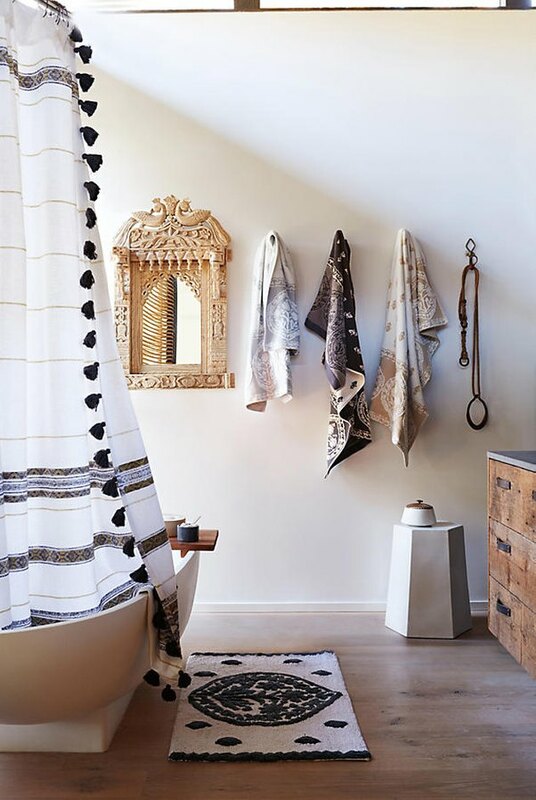 In this case, a tassel-trimmed shower curtain, a hexagon-shaped ceramic side table, and jacquard-woven towels infuse an earthy, bohemian vibe into this bathroom. 9. Let your wallpaper wow. 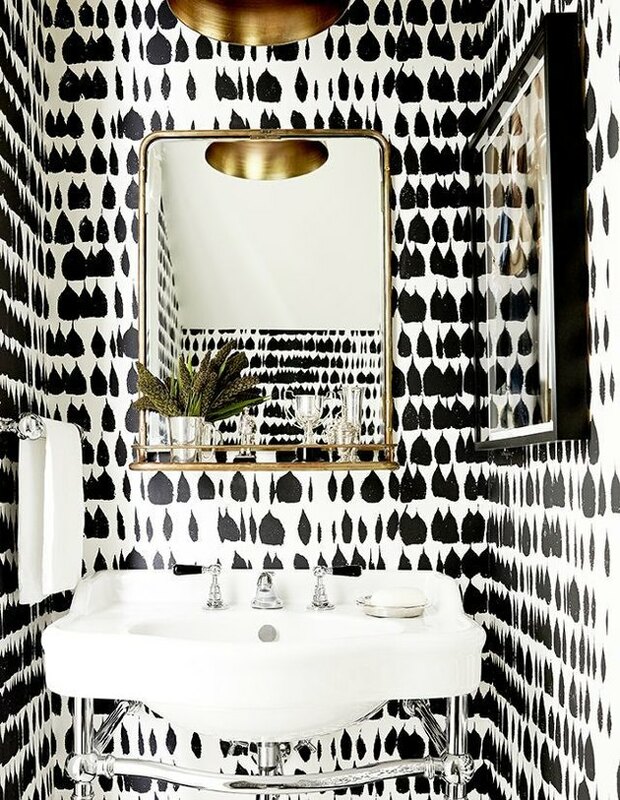 Schumacher's Queen of Spain wallcovering is the bold star of this petite powder room. A few functional flourishes — a gold frame vanity mirror with shelf, a pedestal sink with exposed piping, and a modern pendant light — complement the hip vibe while letting the wallcovering shine. 10. Stencil a statement wall. This guest bath gets a major upgrade courtesy of a fresh coat of paint and new hardware. 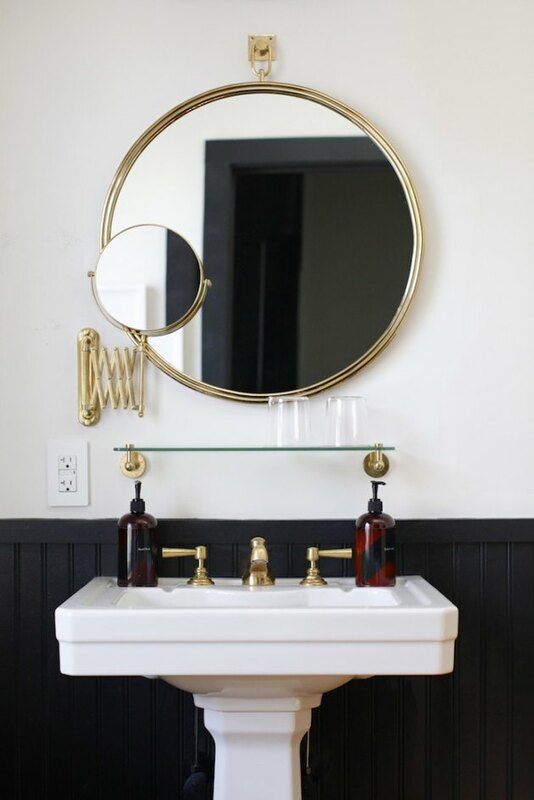 The white cabinets, brass pulls, and fixtures pop against the black granite countertop. 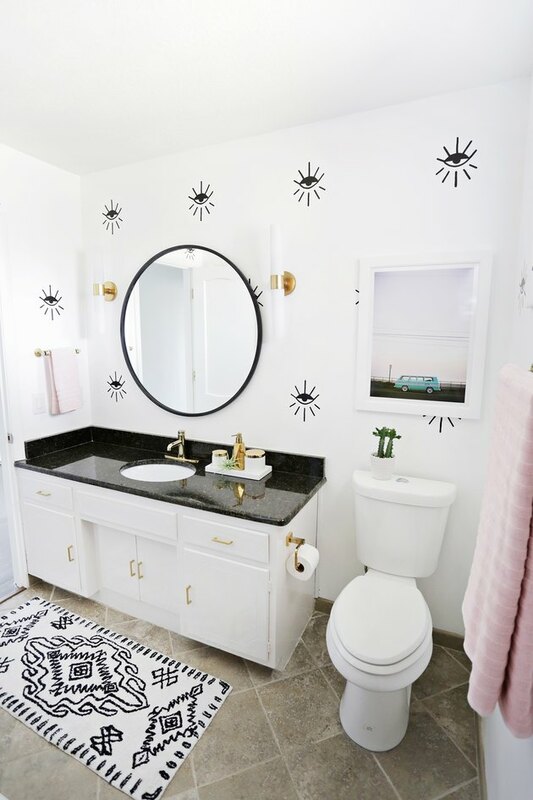 Evil eye-embellished walls and a tribal bath mat complete the look. 11. Don’t discount a pedestal sink. Fact: Pedestal sinks don't provide storage. That said, sometimes they're the most visually pleasing option for a particular space — and that matters! Hanging an unassuming glass shelf below the vanity mirror provides a little extra storage space without distracting from the sophisticated design.